The Joy Of Geocaching, a labor of love that my wife Dana and I have been working on seemingly since the Reagan administration, arrived at the publisher’s warehouse this week. This project began in July, 2008 and proceeded through many twists and turns – including the demise of our first publisher – before reaching the finish line. Publication of a book is a good time to reflect on what you’ve learned and I realize now how much I learned about social networking from this project. If you’re not familiar with geocaching, it’s an outdoor game played by three to four million mostly adults worldwide. Players hunt for hidden containers using global positioning receivers. The geographic coordinates of the containers – which can range in size from the tip of a pencil eraser to, in one case, a Nissan Pathfinder – are published at Geocaching.com. The photo shows an example of a particularly clever container. All containers must contain a paper log, but nothing more is required. 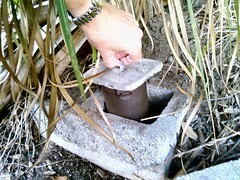 The joy of geocaching is in the hunt and the reward of finding a geocache is nothing more than satisfaction. Geocaching.com recorded its one millionth active geocache placement early this week. Sounds simple and maybe a little weird, right? I certainly thought so at first. But as Dana and I began to geocache and then talk to people who love the game, we found that an enormous social network had developed around it. People were forming new relationships, repairing old ones, improving their health and re-connecting with nature in ways that would have been impossible without technology. We met people who have logged more than 35,000 finds over the last eight years. One small circle of friends drove 12,000 miles – and flew another 10,000 – in a mad dash to find a geocache in all 50 states in 10 days. Another team spent weeks planning a speed run that netted a record 413 finds in 24 hours. Their record was broken just five months later. We met an elite group of “extreme geocachers” who pursue containers hidden under water, on abandoned railroad trestles, deep in mine shafts and at the top of 100-foot sheer rock cliffs. Then there are the people who hide caches. Some of them spend days constructing elaborate themed networks consisting of dozens of containers. Others concoct puzzles so devious that we didn’t know where even to begin to solve them. The social network that ties this community together is a quirky website run by a rather reclusive profit organization in Seattle called Groundspeak. The Geocaching.com website is basically a database with a few HTML pages and some query forms. It has almost none of the trappings of Web 2.0, not even photo tags. The only means users have to create content is its rigidly formatted description pages and comment forms. Yet despite those limitations, the geocaching community has done some wonderfully inventive things. Geocaching has its own language. More than 100 clubs and associations have sprung up in all 50 states and overseas. Geocachers arrange community cleanups, stage fund-raising events and help each other in times of need. They created “event caches” long before the concept of the unconference caught on. And they’ve done this without any prompting from above, using a simple website built around a simple game. There Is No Substitute For Passion. Groundspeak does almost nothing to market the game. It provides an online meeting place, a newsletter and some basic services in exchange for a $30 annual fee. Geocaching has spread to an audience of more than three million players entirely by word of mouth. The one million records in its database have each been meticulously reviewed by a team of volunteers. It’s Not About Technology. The Geocaching.com website is five years behind the technology curve. It has some rudimentary Web 2.0 features, but few members use them. The website really does only one thing well, but that’s all its users ask it to do. Too much technology would actually complicate the experience. People Basically Want To Do The Right Thing. Every community has its petty rivalries, but in interviews with more than 60 enthusiasts and casual conversations with many more, we encountered only one case in which a dispute resulted in the destruction of personal property (a geocache). In contrast, we heard dozens of stories about geocachers putting their personal safety in the hands of total strangers simply because the person was another geocacher. Peer Recognition Matters. One of Groundspeak’s early innovations was to keep a running tally on its website of each member’s total hides and finds. This is a source of a constant friendly rivalry among players. Top geocachers not only know their own tallies but also the totals of those nearest to them in the hierarchy.The drive to be visible is an incredible motivator. Simple Succeeds. I noted in a column last year the irony that Twitter, with its stripped-down simplicity, has been a social media mega-hit while the technically elegant but byzantine Second Life has faded into a niche. In the same ways, geocaching succeeds because it keeps the rules simple. This has enabled players to develop an incredibly rich variety of variations, and Groundspeak has commendably remained open to letting them take the game where they wish. There’s so much more I could say (224 pages worth, in fact!) about this remarkable community, and I’m hoping to develop a presentation around this topic for business audiences. It will include lots of funny, scary and touching stories that we learned in our research and show how online connections can contribute to more meaningful real-world relationships. I need a sponsor, though, so if your company or group is interested in bringing me in for an entertaining and instructive one-hour session on how an online network can drive millions of people into the woods to reconnect with nature, please drop me a line. The NewComm Forum, April 20-23 in San Mateo, CA, if one of the best-kept new-media conference secrets. Just have a look at the speakers and sessions. This is an essential conference if you want to know what’s coming in this rapidly developing field. My newsletter subscribers get a special discount on top of the early-bird rate by using discount code NCF118, but hurry, because today is the last day for early-bird savings! I’ve got geocaching on the brain this week, so if you’re into the game, or planning to give it a try, be aware of the most powerful software tool available to serious geocachers. It’s called Geocaching Swiss Army Knife (GSAK), and every serious geocacher I know uses it. 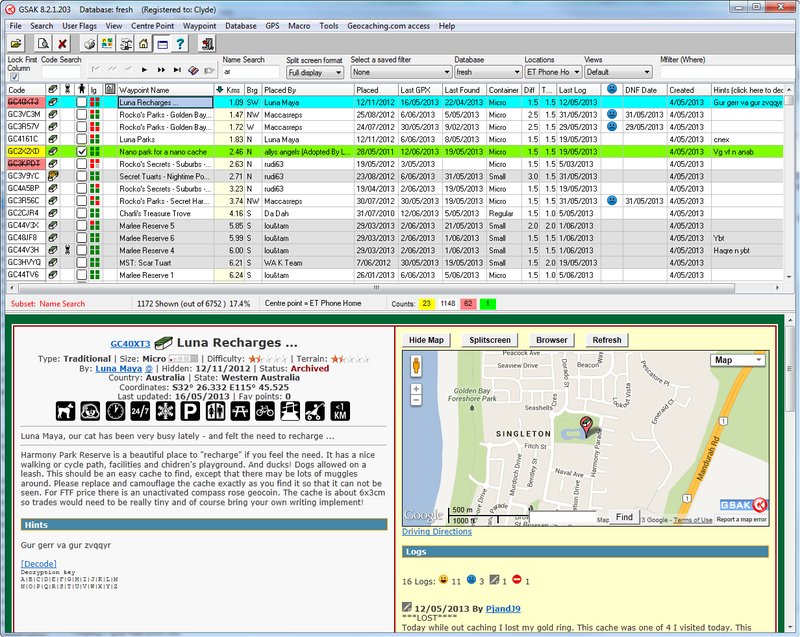 Created by an Australian former IT manager, GSAK is a powerful database manager for geocaches. You can use it to store details about thousands of caches and select your targets with a high degree of precision. So if you want an easy day of caching with a few simple targets within walking distance of your hotel, a simple query will give you a list you can load into your GPS receiver and go. You can also annotate cache listings with your own notes, create a list of caches along a route, store queries for later use and see the caches you’ve selected displayed on a map. GSAK is a free download, but a nag screen kicks in after a few weeks. Most serious users opt to pay the modest $25 fee for a lifetime license. The folks who brought you the wonderful Fail Blog have aggregated some of their best media miscues into Probably Bad News, a site whose tagline is “News Fails, because journalism isn’t dying fast enough.” You can upload your own favorite typos, double entendres and acts of sheer stupidity for others to vote upon. Many of the examples involve computers gone haywire, which lack the sheer hilarity of printed mistakes, in my view. But there’s some good stuff there, anyway.